Technical Architect CV Examples – Template. 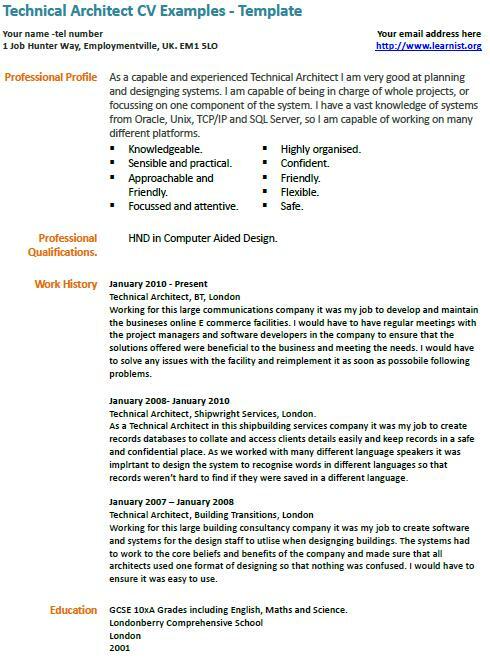 Amend this CV example as suitable and write your own CV in minutes. This sample is free and fully editable. As a capable and experienced Technical Architect I am very good at planning and designging systems. I am capable of being in charge of whole projects, or focussing on one component of the system. I have a vast knowledge of systems from Oracle, Unix, TCP/IP and SQL Server, so I am capable of working on many different platforms. Working for this large communications company it was my job to develop and maintain the busineses online E commerce facilities. I would have to have regular meetings with the project managers and software developers in the company to ensure that the solutions offered were beneficial to the business and meeting the needs. I would have to solve any issues with the facility and reimplement it as soon as possobile following problems. Technical Architect, Shipwright Services, London. As a Technical Architect in this shipbuilding services company it was my job to create records databases to collate and access clients details easily and keep records in a safe and confidential place. As we worked with many different language speakers it was implrtant to design the system to recognise words in different languages so that records weren’t hard to find if they were saved in a different language. Working for this large building consultancy company it was my job to create software and systems for the design staff to utlise when designging buildings. The systems had to work to the core beliefs and benefits of the company and made sure that all architects used one format of designing so that nothing was confused. I would have to ensure it was easy to use.